When I finally saw him I thought: "Here's a bear a lot like me. He's older, he's worn out, his body marred from living life to the limits. He's just what I am looking for for my 50th." 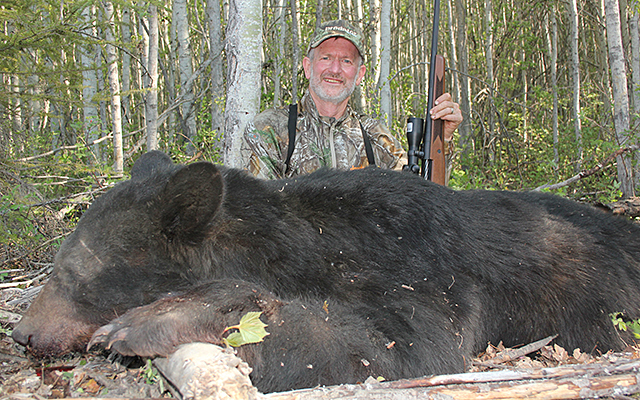 It all happened very fast, and when it was finally over and I was able to walk over and touch my 50th black bear, the surge of emotions and flood of memories were overwhelming. I hunted the same stand as the prior evening, the sign telling us that a bruiser was lurking nearby and that patience — not my strong suit — was the order of the day. Early on I saw two of the three small bears I saw the evening before, but they wandered off early and for almost two hours I saw nothing but mosquitoes. Then in the still evening air I heard a stick crack off to my left, and when I slowly turned my head there he was, a whopper bear coming hard with a body posture that told the world that here comes The Man. He was just 20 yards away, and I could see that his hide was rubbed, his face scarred, both his rear legs devoid of any hair below the calf muscles. Most would have passed for that reason, but I thought, "Here's a bear a lot like me, he's older, he's worn out, his body marred from living life to the limits. He's just what I am looking for for my 50th." His hide later squared an honest 7 feet, 2 inches. Topping it off my hunting partner John Zent, Editorial Director for the NRA's Publications Division who had to jury rig his scope mounts to get his rifle working, also shot a 6-10 boar, and my old friend Gerry Bethge shot a 7-footer as well. We all have another tag, and are heading out again this evening. I'll keep you posted. Follow Bob Robb on his latest #questfor50 and #goldenbear on Twitter and Facebook.